It’s been 7 years, and the great iOS vs Android debate rumbles on—in internet forums and real life. But these platforms have come a long way even in the last year or two. Do the old arguments still apply? What features separate iOS 8.3 from Android 5.1 Lollipop? We used a Nexus 6 and an iPhone 6 to investigate. The ground rules are now well established: iOS is very much Apple’s software, and you either accept it or find a different phone. In contrast, Android lets you swap out one dialer or SMS app for another, supports home screen widgets and even lets you install alternative launchers if you want to (now an official feature with Lollipop). That’s the first major difference that most users are already aware of. The second is that Google apps run quite happily on iOS, whereas Apple programs are nowhere to be found on Android. It’s not only apps, either: Moving your emails, contacts, music, movies, photos and documents from Android to iOS is much easier than trying to transfer them the other way. Again, this is a well-established contrast between the two platforms—let’s dive in and see what else is different in 2015. The sharp, flat, clean lines of iOS 8 owe a great debt to iOS 7, when Apple dragged its mobile OS into the modern age. Google’s bold and colorful Material Design, meanwhile, introduced with Android 5.0, wants to unify the visual experience across all of your apps and act as a guide for your eyes at the same time. Both are distinctive and easy on the eye—if you’ve grown used to one you may not particularly care for the other. Overall, Apple’s mobile OS adopts the more refined aesthetic, whereas Google’s carries more of an impact. Both are beautifully designed, in their own way. On the whole, notifications work in a similar way whichever platform you’re using, and the differences that still exist are small and subtle: Apple’s software still lets you set notification styles on an app-by-app basis, for example, whereas Google’s software makes it easier to clear and respond to alerts from the notification drawer. With Lollipop’s new Priority mode, Android finally has something to rival iOS’ Do Not Disturb feature, though both implementations can be a little tricky to get your head around at first. Then there’s the back button, a must-have for Android veterans and a confusing irrelevance for anyone well-versed in the ways of iOS. It’s one of those differences between iOS and Android where there’s no real right or wrong way—it depends what you’ve grown accustomed to. Siri up against Google Now is an interesting head-to-head. Siri is more about voice control—pulling up information with your voice, and using your phone hands-free. Google Now accepts voice input too, but the main focus is on pre-emptively throwing up information it thinks you’ll need based on your emails, search history, recent travels and so on. We’ve already talked about customization, the way you can reskin Android pixel-by-pixel if you want to—there’s no such capacity on an iPhone. In-app sharing offers a significant contrast too: Android lets you share pretty much any file through any app, and while iOS has opened up slightly in this regard, it still lags behind. Both Apple and Google offer a strong set of native apps to get you up and running, though of course Google’s are all available on iOS, whereas Apple snubs Android completely. In Hangouts Google has an overarching messaging service that works almost anywhere, though iMessage and FaceTime are arguably more polished. A blow-by-blow comparison of each app would take up another dozen feature-length articles, but in most areas—email, maps, contacts, calling—both iOS and Android have the tools you’re going to need. You could argue that Google is the more innovative in email, with Gmail and Inbox, but Apple Mail is no slouch. Moving on to third-party apps, and broadly speaking all of the big hitters are going to be found on both platforms. In terms of new releases, though, there’s still a bias towards iOS, with Periscope and Meerkat being two of the most recent examples—if you’re ready to join the live-streaming revolution, then you need to own an iPhone. Both will no doubt eventually get around to Android (Meerkat already has in beta form) but there is sometimes a delay. On the flip side, Google often releases smaller apps (like Field Trip or Google Keep) on Android first, as well as updating bigger apps on its own platform before getting round to iOS. Third-party apps have always been a strength for iOS, and that still holds in 2015. The iPhone got in first with the App Store and it’s easier to code for (with fewer devices and less fragmentation). Android isn’t the app disaster than Windows Phone or BlackBerry is, but it still hasn’t quite found parity yet. App permissions are also handled differently—on Android, it’s an all-or-nothing decision that you make when you install the app; on iOS, permissions like location and camera access are asked for one-by-one, and you can revoke them at any time. Touch ID is a big win for iOS and has hugely improved the experience of unlocking a phone or verifying a purchase. The various flavors of Android are trying to catch up, without much success—Samsung is the only manufacturer to have brought fingerprint-sensing technology to Android devices on a regular and consistent basis so far. With Android Lollipop you do get the ability to ‘trust’ areas and even devices (like a Bluetooth car stereo) so that the PIN code is automatically disabled, making for a more customizable and flexible security setup. Lollipop has also finally joined iOS in offering full device encryption by default (on Nexus devices at least—it’s not yet mandatory for others). App security is another common discussion point. There’s no doubt that Android isn’t as locked down as iOS is, and thus it’s easier to get unauthorized software on your devices. That said, if you stick to the Google Play Store, the risk is minimal—last month Google confirmed that all apps are reviewed by staff prior to approval, and scanned for security issues. As for stability and performance, the waters are muddied by the multitude of Android handsets and older iPhones on the market. The latest data from Crittercism points to a crash rate of 2.26 percent on iOS 8 and 2.2 percent on Android 5.0—on balance it’s perhaps fair to say that iOS and Android both run very smoothly on the latest hardware and are susceptible to the odd hiccup on older devices. All factors considered, iOS wins in the security department, but not by a huge margin. In part, a slightly higher risk of malware or instability is the price users pay for the extra customizability and flexibility of Android. There are so many extras to pick from: Apple Health vs Google Fit, Apple Pay vs Google Wallet, Android Auto vs CarPlay. For the sake of finishing this feature before iOS 9 and Android 6 appear, we’ll have to limit ourselves somewhat. Music and movies seems a good area to take a brief look at: Android doesn’t have the same kind of desktop management software that Apple has in iTunes. Android users can of course tap into Play Music and Play Movies, and while those apps are improving, they don’t offer the same kind of control or indeed breadth of content as iTunes does. Google’s focus on the cloud isn’t quite as useful for managing your own personal media library as it is for email or online office suites. That’s not to say you can’t cultivate a library of tunes, TV shows and films on Android, but it’s not as straightforward as it is on iOS. On the other hand, anything you buy from Apple’s shop won’t work on Android; patrons of Google’s various stores can get at their content from anywhere. Finally, it may seem unfair to mention this in a software comparison piece, but the iPhone’s camera has for many years been putting Android manufacturers to shame: In speed, in quality, in pretty much every area that matters, Apple is ahead of the competition here, even if it isn’t necessarily the fault of the Android software. Nearly a couple of thousand words later, and in some ways we’ve barely started to scratch the surface of iOS vs Android—that’s an indication of how these smartphone OSes have expanded in scope and influence, and how versatile the modern-day mobile phone actually is. Read through some of the iOS vs Android thought pieces on the web and you’ll find that a lot of the time it’s the small differences that count: The positioning of a button, or the way a specific feature is handled, or a reliance on one particular app or another. Yet get above that minutiae and you find that Apple and Google have fundamentally different ideas about the way that software, hardware, the web, user data and privacy should be handled. On one level, iOS and Android have never been more similar; on many others, they’ve never been further apart. 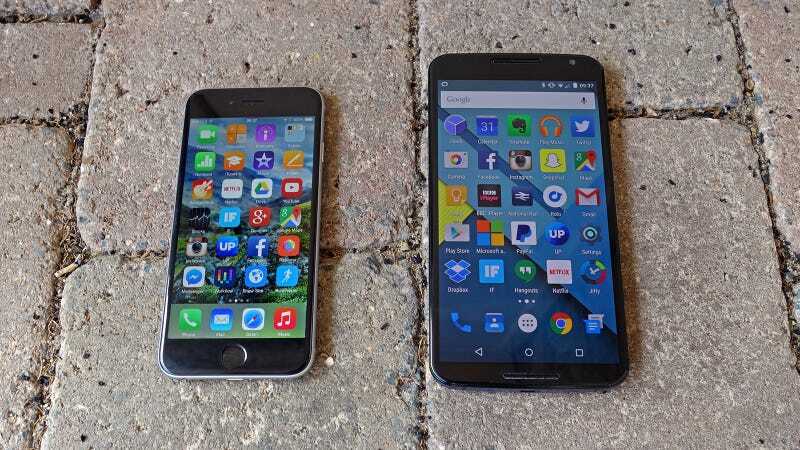 As Google and Apple borrow features from each other, and both these mobile OSes get better and more mature, choosing between them has become less about comparing a checklist of features and more about everything that’s beyond iOS and Android—in 2015 it involves choosing an ecosystem, choosing who to trust with your data, and choosing how you want to live your digital life across smartphones, computers and the web.